Barn Building with The Brothers Rodriguez. Jorge & Juan Rodriguez Strike a Pose on the Balcony of the Eco Barn They are Building with Family in Barryville, New York. Photo George Abetti. 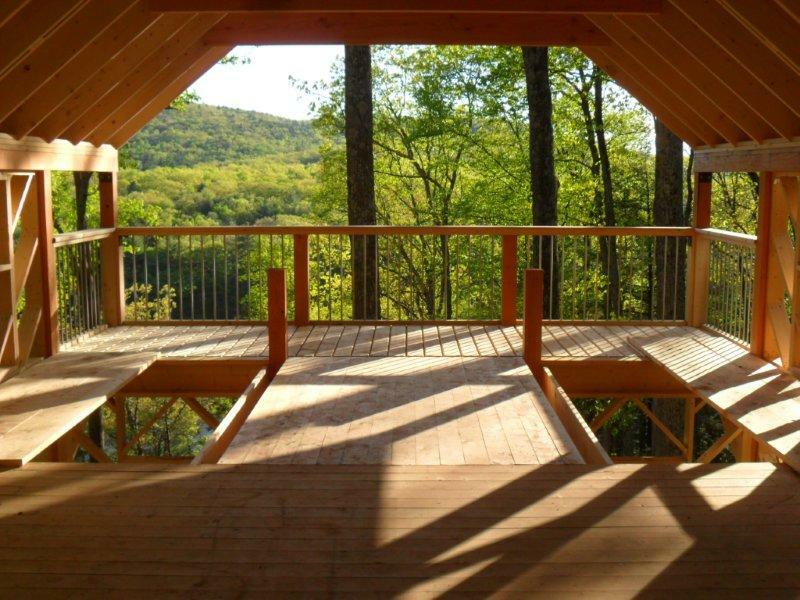 The building venture we are project managing in Barryville, New York is beautifully manifesting itself. Last week we met at the site with the clients, Jorge & Juan Rodriguez, Geobarns' extraordinary philosopher - builder George Abetti and the tradesman who have joined the team to complete the project. One thing we've learned in working on this project is that the key to good building is clear, open-ended communication among all participants involved from start to finish. And, there are a lot of important contributors: the architect, the framer, electricians, plumbers, mason, excavator, engineers, insulation experts and the well driller. Much like making a movie or producing a play, building a custom designed house is beginning with a good idea and curating a one of a kind - for that place and moment in time - team to create magic together. George Abetti (kneeling) working in the first few days of the framing phase. 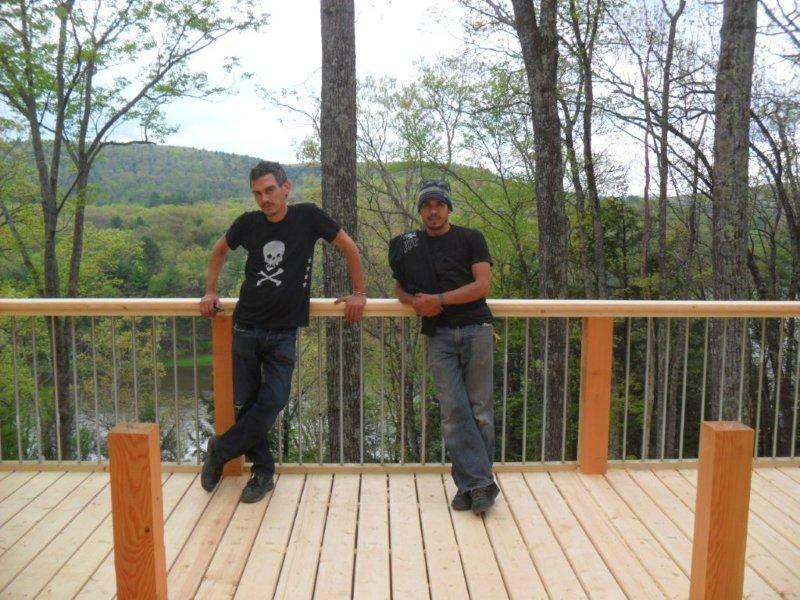 The Delaware River below, balcony not even roughed in yet. Photo Joseph S Walker Jr.
George's unique diagonal framing, which uses less material than conventional stick built frames, rises from the foundation completed by the mason, John Diehl. This special framing is so strong that it does not require OSB or plywood sheathing, greatly reducing the material needed. 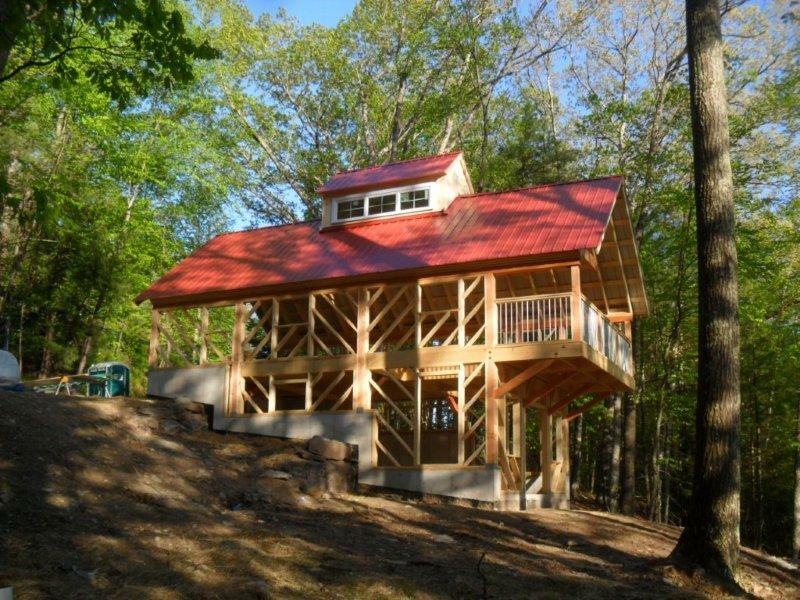 John's tiered foundation is deftly tucked into the sloping hillside overlooking the majestic Delaware River. Photo Joseph S Walker Jr. It's crucial to realize that good green building is not just about technical ability and knowledge. It's also about the way people working together interact. Environmentally conscious building is about good will as much as it is about measuring sill plates. How we treat each other in the process of building is as important as how we treat the wood with which we build. George exemplifies this philosophy when he says: "Our company has become a vehicle for ministry whereby we have discovered a venue in which we can love others in what we build and, more importantly, the way we treat them as we do. For many people a building represents one of the most significant financial outlays they will ever make, so we are given a sacred trust." Juan and Jorge talking with one of the plumbing subcontractors, Damian Alaimo. They reviewed details for the fixtures to be installed after the plumbing rough in is accomplished, type of water heater to be used (Stiebel Eltron Tankless electric) and where to locate an outdoor hose outlet. Damian might also help to install the super-efficient Mitsubishi mini split HVAC system. Photo Joseph S Walker Jr. Working on this project, we greatly appreciate how fortunate we are today to have the Internet and modern communications to more efficiently facilitate the curation and creation of this gem of a structure. It was so efficient and productive to transmit files back and forth during the various planning phases, easily involving all of the participants to line up each part of the puzzle. George, based in Vermont, actually spent part of the pre-framing construction phase in Napa, California where he was building an amazing barn for Stag's Leap Vineyards. Despite our being on opposite coasts, we were able to effectively include George in important communications with the mason about the foundation before it was poured to ensure all would be ready for his specific framing method. Bill Brinnier, the architect who worked with George on the project plans we filed at the building department, was also a key member of the building team. His involvement was vital to the successful coordination of the plumbing rough in for the slab with plumber John Mall & mason John Diehl and the connection of the waste line from the house foundation to the septic tank with excavator Norm Sutherland. George Abetti speaking with Tyler Hornbeck who is an electric sub for the project along with Jeff at North East Electric. Tyler and George reviewed how to wire a home built with the unique framing technique and timing for raising the roof after which Tyler and his team can bring in the overhead electric from the nearest NYSEG power line. Photo Joseph S Walker Jr.
A very cool thing about this building project was how much serendipity there was too it. For instance, we met the electrical subcontractor, Tyler, through a daisy chain of small worldness. Tyler worked on a guest cottage for a neighbor about a mile away from where I live in Accord, N.Y. I did not know the neighbors until they found George on line. George connected us to them because he ended up building a beautiful, gem-like yoga studio for them. Funny thing was, I do this 4 mile hike near where I live and work and I always walked by this neighbor's property and wondered who they were. Now they invite me to come pick produce from the organic vegetable garden created near the yoga studio George built. The New York City-based Architect, Drew Lang, visiting the Barryville site and discussing with George Abetti a future project we might all be working on together. Photo Joseph S Walker Jr.
Day 11 of George and the framing. Roof and cupola are in. Photo George Abetti. So, a precious, small-foot-print eco-barn rises, born of healthy materials and healthy attitudes. As a sometimes hardened New Yorker, caught up in the race to keep finances and life's stresses in order, it is almost not easy to believe that something as potentially difficult and complex as building in New York could turn into a celebration of the power of collaboration. George said in one of the many conversations we have had over the years: "We have lost a huge component of life in giving up working with our hands and/or doing work where we can tangibly engage ourselves in the process and see some of the direct consequences of our efforts. We live in a culture where we have ceded this to economic gain and greed. There was a time when kings fought over artisans and they were considered honorable and revered and emulated, but not so much so today. What we have as a consequence is a disconnect between our work and our sense of cause and effect. Little that we do seems to ultimately impact us." Luckily, there are many of us around the planet who are awakening to the realization that even small things we do can have huge impact on us and our surroundings. As George said: "We as people are extraordinarily sensitive to our surrounding environments. My prayer is always that building with our clients will become one of the most positive experiences of their lives. One cannot build in the mere context of a financial transaction. There has to be a relationship out of which the building is a result and testimony of blessing." "The whole wide world is a cathedral. I stand inside, the air is calm. the echo of a psalm." Photo of the interior frame looking out beyond the balcony of the house, nestled quietly into the surrounding landscape. Photo George Abetti. Copyright Paul E. McGinniss 2012. I had a great experience working with George, and his crew 11 years ago, building our Geo Barn. I'm sure it will continue to serve our needs for many years to come.